On Wednesday April 6, 2016, the Mi’kmaq-Wolastoqey Centre (MWC) at the University of New Brunswick will host the 2nd annual UNB Powwow: “Dancing Towards Reconciliation” at the Richard J. CURRIE CENTER, UNB Fredericton from 12 to 5 p.m. This is a free public event and everyone is invited to attend. This year, MWC has chosen to focus its theme on the Truth and Reconciliation Commission (TRC), in an effort to garner support and emphasize the importance of working towards implementing the TRC’s recommendations and calls to action. 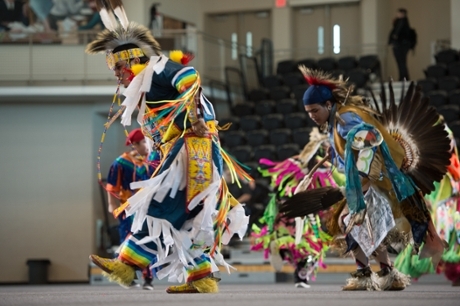 The Powwow gathering provides a unique opportunity for the public to participate in, learn and celebrate Mi’kmaq and Wolastoqey cultures and traditions. The day will begin at 12 noon with an opening prayer by UNB’s Elder-in-Residence Imelda Perley, followed by special guests addressing the importance of the TRC recommendations as a way to honour residential school survivors in the Atlantic region. At 12:30 p.m., grand entry will commence where traditional First Nation drumming, chanting and dancing in full ceremonial regalia will take place. The public is also encouraged to visit the many First Nation vendors that will be selling traditional art, crafts and food. Grand exit will be at 5 p.m., which will bring a close to the Powwow. We are thrilled to have Eastern Eagle, Muskrat Singers, and Birch Creek Singers as our drum groups. Our head male and female dancers this year are River Sacobie of St. Mary’s First Nation and Ashley Julian of Sipekne’katik First Nation. Our junior head dancer is Bronson Acquin-Mandisodza of St. Mary’s First Nation.